Mr. Rose-Breasted Grosbeak at my House! – Let's Paint Nature! Mr. Rose-Breasted Grosbeak at my House! What a handsome man! Look who just came to my house! Isn’t he something! This is a male rose-breasted grosbeak. He is a summer resident in Chicago and I am very happy to be his hostess! This is my fist sighting of the year and last year I didn’t even see him. ← Let’s Paint a Siberian Iris! what a strikingly handsome fellow! and such a stylish feeder, maybe that attracts him. great photos, thanks for posting! Yesterday evening I was cooking my dinner and looked out my kitchen window and there chowing down at my feeder was Mr. Grosbeak. Another bird I had never seen in this area before. I ’bout ruined my supper trying to get a photo and cook too. Good work on yours! …you’re so lucky to have them at your feeder. I have to go to our nature center to catch sight of them! That’s great. 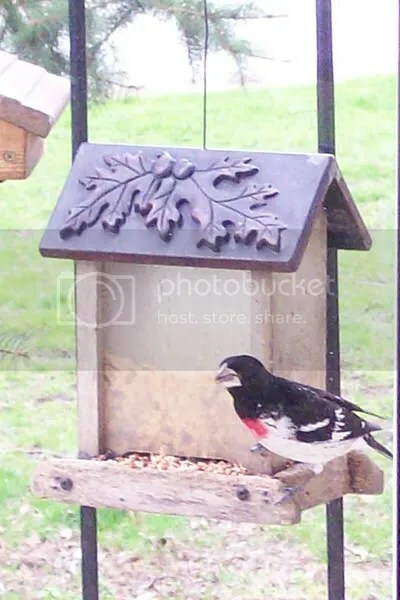 I haven’t seen my first rose-breasted grosbeak yet so your photo is a treat for me. They don’t stick around at the feeder too long for me. Leslie: Thanks so much! When I first spotted him, I think I gasped (out loud!) lol! Kelly: Yes I am, I thank my neighbor…I don’t even fill my feeders everyday! Thanks! Joan: Oh you’re welcome! 😀 Isn’t he handsome! Thanks! Lana: Yes I agree, I hope mine stays a long, long time! I saw this beautifu bird –3 of them on my feeder a few minutes ago. 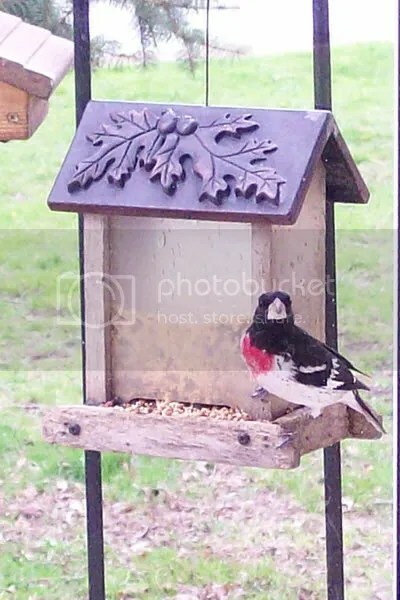 I looked on my calendar and it is a rose breasted grosbeak. I have never seen this bird before. I am in Ft wayne In. Is this rare??? Barb: Congratulations!!! This bird is a summer visitor to your area too. While not rare, I don’t often see them at feeders a lot. Last year I did not see them at all by my house! They perfer woodlands next to open fields. They will migrate back to Mexico, Central and South America in the fall…so enjoy them while you can! Make sure you write down the date you spotted them and location (your birdfeeder), you will want to remember this later!